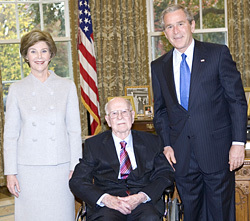 President George W. Bush and Laura Bush present the National Medal of Arts award to Ollie Johnston. White House photo by Eric Draper. Ollie Johnston is renowned for his role in pioneering film animation with the Walt Disney Studios. He created, drew, and developed story lines for some of the most endearing characters on screen. Born in 1912 in Palo Alto, California, Ollie Johnston attended Stanford University and the Chouinard Art Institute in Los Angeles, studying under Pruett Carter. He joined Walt Disney Studios in 1935, after only one week of training. Johnston's first assignment at Disney was as an in-betweener on the cartoon short, Mickey's Garden. (An inbetweener is an artist who creates the drawings that appear in-between the extremes of an action that are drawn by animator.) The following year, he was promoted to apprentice animator, working under Fred Moore on such shorts as Pluto's Judgment Day and Mickey's Rival. His first feature-length film was Snow White and Seven Dwarfs followed shortly by Pinocchio. His humor, sensitivity and acting abilities proved to have lasting appeal and his skills at communicating these qualities in his drawings earned him a spot as one of Walt Disney's "nine old men." This irreverent reference had nothing to do with age but rather referred to the studio's elite inner circle of animators. One of Johnston's proudest accomplishments was his work on the 1942 film Bambi, which pushed the art form to new levels in its portrayal of animal realism. In 1946, for the film, Song of the South, Johnston became a directing animator. He served in that capacity until his retirement in January 1978 following work on The Fox and the Hound. Since retiring from the studio, Johnston has found success as the author of several books on Disney animation (written in collaboration with his lifelong friend and colleague, the late Frank Thomas). His first book, Disney Animation: The Illusion of Life (1981), serves as the definitive treatise on the storytelling, comedic, and drawing principles that help today's animators. Later books include Too Funny For Words (1987), Walt Disney's Bambi, The Story and The Film (1990), and The Disney Villain (1993). 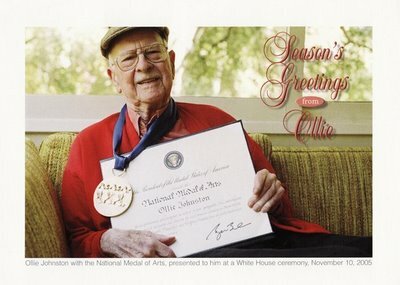 Johnston has inspired and helped train a new generation of animators to continue the Disney tradition and serves as a senior ambassador for the art form he helped pioneer and popularize. The concepts he developed are the basis for animation courses taught in schools today.